Denver is a basement finishing mecca. Few areas of the country have such a high percentage of homes with a finished basement, and therefore you see some of the best basement designers and construction firms in the country located here. Years of experience in basement finishing. Basement finishing as a core service. (a Deck company may build basements, but nothing replaces the knowledge, and therefore price savings you get with a company that focuses on Basements. Local current references. This is huge! I am surprised how often homeowners fail to check references. A good contractor will have at least 10. Membership in BBB or other industry associations. Not a must, but a plus. If a company has the 10 local relatively recent references, this is far less important. Buy the construction monitor online and check the permit history of a contractor. You can view 12 months worth of history, and therefore make your own calls to their clients they don’t list as a reference. Ask them what the biggest challenge they have has this year, and how they overcame it. ( It will tell you a lot about the company). 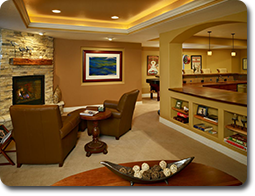 Here are four basement finishing companies we have represented or do represent for marketing that will score very high. ElkStone is one of the largest basement finishing companies in the world. And my last thought is, there are many good basement finishing companies in Denver. After you have gone through the checklist and found several, it really comes down to who you want to work with. You will be communicating a great deal with your selected company, so make sure you have met the team and are comfortable and like your project manager. Thanks for sharing your views… You’ve given me an idea what are the things to do.. wanted to have my home remodeled one of this days… thanks! I grew up in a house with a finished basement, and it was really nice. I would think that if you want a finished basement you should make sure that it is protected from water. I would want to get the best company that waterproofs basement to come and do the job.